To the team at KMS Style is a visual language that unites creative people everywhere. They use the powerful language of style to collaborate with our community and collect ideas — curate — from the most inspiring places in the world. Runways, urban fashion districts, the streets. The KMS team are constantly learning the latest trends, gaining artistic inspiration and expanding their creative knowledge. They strive to be a style innovator and set trends by sharing inspiration. Hence why KMS recently decided to rebrand their product line and they created the ingenious and style driven new collection – Start, Style, Finish. 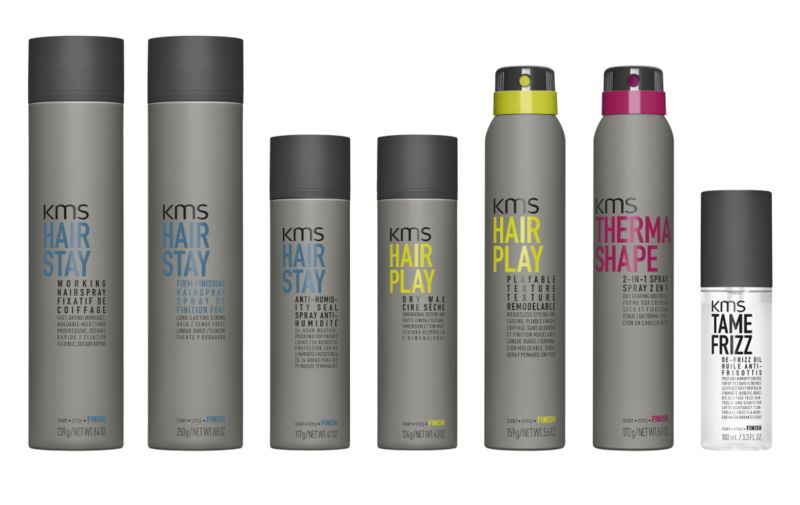 All KMS products are multi – compatible: they work best when used as a 3 step regimen together, and each step benefits the end style! Formula matters to KMS. That’s why they’ve included selected pictures next to all the products – so you can easily see what protection and life choices are included in the formulas which include ‘free from’, ingredient info, protective qualities and information such as dermatologist tested. As well as the new innovative concept, the KMS products have been given a stylish revamp to. The products aesthetics are now very minimal and have a professional appearance, fit for a well-respected hair salon or a customer who appreciates simple, yet sleek product designs.